I'm going to do the Green River to the beach trip next month. I really liked the pics. If you plan on doing it again let me know. I live in Riverside but I am an amateur weekend warrior when it comes to riding. Are you really Macedonian lineage? I was looking up history on Alexander the Great the other day & found out more info on the entire area of Yugoslavia (Serbia, etc, and their connection to Greece). Anyway, I once was engaged to a Serbian American who should be about 85 years old by now. However, today I was looking for Ike Clanton, decendant of the Clantons of Tombstone as I know he was/is an actor and lived in Norco, CA. As it turned out, your page on Norco and horses held my interest. I was born in San Bernardino but my family moved to Chino when I was 7. 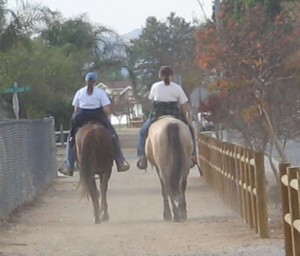 Although we moved away to live up near Yosemite/Mariposa way for 8 years, we later returned to Chino. 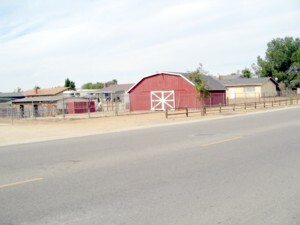 Growth in Chino came after the 1950's. 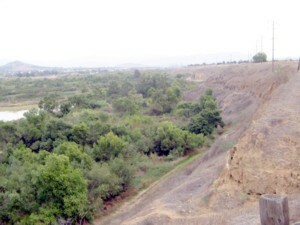 You mentioned Prado dam and the Santa Ana River. My family and I used to swim there all the time. In the early 1940's, there were tomato farms down there before there was so much water going by. My aunt once found some confederate bills hidden in the bushes. She folded the money and made little paper boats out of it and sent them down the river. When you mentioned Butterfield Road - my friends, the Abacherlis, originally from Chino, owned all of them thar hills where the Butterfield Homes were built on Hwy 71. 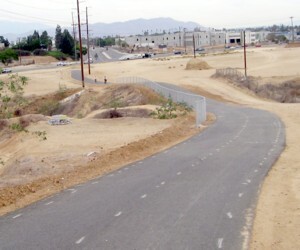 As for Rincon Rd., the Yorba-Slaughter Museum is nearby. Mr. Slaughter, from Missouri, married one of the Yorba daughters. 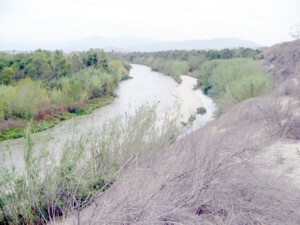 As for the Prado Regional Park, I wrote and exhibited a play there for the dedication of the Laguna Moreno at the Park in 1982. The Prado Country Club w/Golf Course is also nearby. That little creek across from it was where I used to gather watercress for my family when I was a little girl. We loved to eat it. Now I have some growing in my back yard. I am presently writing a historical book as my Spanish ancestors came to the New World back in the latter part of the 1500's. They ended up in Santa Fe, New Mexico, where they settled around 1640. Captain Pedro Cedillo Rico de Rojas was born in 1611 and a member of the Conquistadores Sociedades. He had 8 children who were later raised in Albuquerque as in 1680 the Pueblo Indians attacked the family home and they fled. They were living on the northern side of Albuquerque for 26 years when the town was founded and given its name in 1706. There is a cemetery by the name of Sedillo (Cedillo) and a town by that name, as well as a long road by that name. I recently discovered a mountain there also of the same name. We have only been in California for 208 years. The old town of Chino also has a lot of descendants of old California families, such as, Yorbas, Villa, Lugo, Flores, Alvarez, Olivas, etc., and I am indirectly related to most of them. Thanks for your information on Norco. My aunt Loretta was born in Corona in the early 1900s and married a Frank Olivas of the Olivas Adobe (the museum up in Ventura). In fact three of my mom's siblings married into that family. 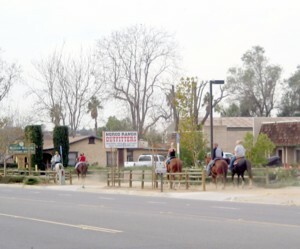 By the way, we have a ranch up in Aguanga and pass by Norco and most of western Riverside County on the 15 often. I don't mind the growth along the 15 except for the traffic. I really enjoyed this section and the posts here, especially those of Ms. Halopoff. I can relate to the feeling of joy / inspiration of riding on the trail and finding something new that is beautififul and a trail section not yet traveled before. And I enjoy learning about California history. 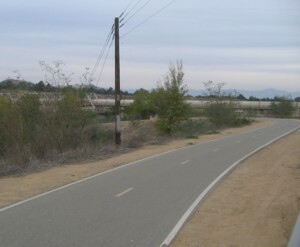 I read tonight that a new 19 mile section was opened in May 2008 which extends the paved trail from Hidden Valley to Waterman Avenue in San Bernadino. I'm thinking of giving it a shot either this weekend or in a couple weeks when I have some family visiting for Thanksgiving. That will be wonderful if and when that ever happens. Kiril - It's me again. Sure enjoyed your pictures regarding the bike trail. It appears that you really get to see the countryside; something one would miss while driving a car because cars don't go there. 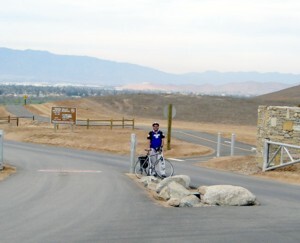 Did Santiago Canyon ever open their added trail? Do let us know what other trips you have taken on your bike. However, be careful of remote areas where mountain lions dwell as they like to surprise people when they are alone. So far, your bike trip to Riverside seemed safe enough as you were close to everything. 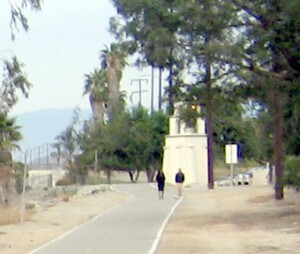 Cycling Dude, I'm considering a ride along the Santa Ana river bike path, beginning at the Amtrak station in Fullerton. Can you recommend a bike friendly route from the station to the river path? Leave the station by going north on Pomona Ave., and then turn right onto Commonwealth. 1. East on Commonwealth Ave.
Commonwealth passes State College, and approaches Chapman Ave.
2. Turn right onto Chapman Ave., enter the city of Placentia. 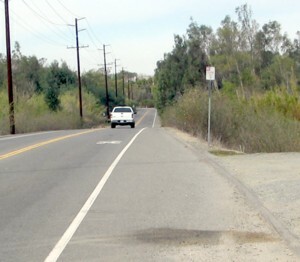 Chapman dead ends at Orangethorpe Ave.
3. Turn left onto Orangethorpe & head east. 4. Turn right onto Imperial Highway (AKA Richard Nixon Parkway), and enter the city of Anaheim. Almost there! Not too far, now! 5. 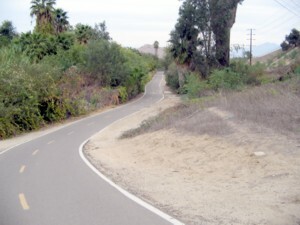 As you pass La Palma Ave. you approach the Santa Ana River, & will see where you can enter the trail. The Riverside (91) Freeway can be seen South of the River. Hi, Kiril, The Cycling Dude. It was two years ago on July 4th that I left a comment, here, re: a litte history. I will be sending you another history article in the next few days re: Santiago Canyon and the early settlers there who as soldiers passed by that area along with Gaspar de Portola, the Spanish explorer on his way to Northern Caifornia (1769). They camped nearby and later one of those soldiers was granted more than 62,000 acres in Orange County. I know most of the descendants of early California explorers and settlers who came here under the Spanish Crown and have a lot of fun giving walking tours at El Pueblo de Los Angeles, telling tourists all about the founding of Los Angeles. This year, I will be personally touring all of the Missions from San Diego on up El Camino Real. Also hope to go to the August Spanish Fiesta Days at Santa Barbara for the first time with members of the Sepulveda, Yorba & Peralta family whose last grant ownership was what they now call "Anaheim Hills." Before Hwy 91 appeared, one could distinguish all of that area that ran all the way up to the Butterfied area and up to Rincon Rd. where the Yorba-Slaughter adobe still stands as a museum. Stop by there should you be passing by on your bicycle. When you see the large cast iron rendering kettle there, keep in mind that I saw that kettle abandoned on the Richard Gird property next to the Los Serranos Country Club in Chino Hills in the 1950s. Richard Gird is the man who plotted the town of Chino in the 1800s and the first owner of the Chino Champion Newspaper. He must have taken that kettle from the Lugo rancho, which adobe was located near Pipeline Avenue where the fire station is located now. Or, Gird could have taken it from the Bernardo Yorba property (Yorba-Slaugher House) and it was returned there many years later. Whats up Cyclingdude, Just took a friend down the path, he loved it! 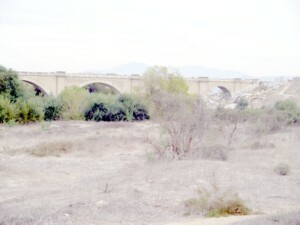 Do you have any updates on the connection to Eastvale River Walk and past down to Prado Dam? Howdy, Kiril, the Cycling Dude! What's you latest cycling experience? Remember me raised in southern and northern California? I now have a URL which I'm starting. Yes, I was afraid of cyberspace somewhat. It's just like in the 1970s when computers came out - I wouldn't accept them. Now, I cannot live without the internet. Here I am in May 2015. We are still here but a little slower due to more years added on to our lives. In fact, today I decided to browse the net once more and was surprised another relative (Tim Halopoff) has just passed away on 4/28/15. It was a year ago last Christmas that another Halopoff cousin passed on in his sleep due to bladder cancer and a heart condition. He was Bill Halopoff of Paso Robles, an artist and art teacher, after having worked and retired from the Ford Motor Company in Pico Rivera as an auto designer. He and his wife Nancy who just passed away were lovely people. It's a long story but Bill and Nancy left us some art drawings which I need to pick up soon. I am in touch with their lovely daughter. We hope that your health is holding up. We are constantly seeing our doctors and doing a lot of follow-ups to keep going. However, I am behind in my exercises. I should do more for myself. Are you still riding the trails? That should keep you in shape. Howdy, Kiril. Still around but at the end of 2015 and the beginning of 2016 had several relatives and friends pass away. Hope things are fine with you and your family.